The Ebola epidemic has hit close to home with a confirmed case in the U.S. Dr. Aileen Marty, an FIU infectious disease professor who recently returned from a World Health Organization mission to Africa, sat down and answered some questions and concerns about Ebola on Reddit for an AMA (Ask Me Anything). 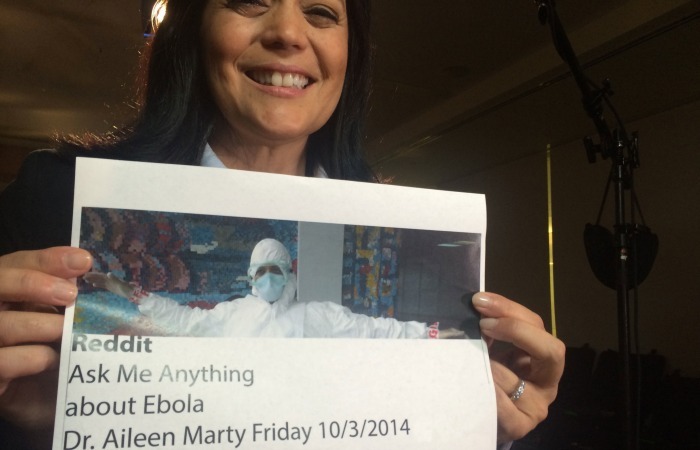 Here were some of the things we learned about Ebola from Dr. Marty’s AMA. 1. You shouldn’t worry too much about Ebola in the U.S.
With Ebola’s arrival to the U.S., the media and citizens are understandably worried, especially knowing what the disease does. However, Dr. Marty confirmed that it’s not time to panic just yet. A redditor gave Dr. Marty a nightmare scenario: Ebola outbreak goes critical for the world, what do you buy at a Costco? 3. Why Ebola is so difficult to contain. One of the unique things about Ebola is how much harder it is to contain than other viruses. Biggest reason: we found out about it too late. 4. Even if you have Ebola, you still have to do your homework. Education knows no bounds, especially in the case of a virus. Dr. Marty shares her experience with treating college students in West Africa. 5. This strain of Ebola is not airborne. Whew. I thought it was the strain that was airborne. Thank goodness it’s not.